What if I told you that the National Associations of Realtors, which has a vested interest in seeing real estate values head higher, released a report stating that they expect real estate values to increase by 5% this year? If you were smart, then you would take this information with a grain of salt, as the National Association of Realtors will ALWAYS have a sunny outlook for the real estate market, no matter what. What if a very successful friend of yours told you to buy Google because it was a very good value right now in his eyes? Based on his track record, and based on the fact that he couldn't possibly be benefiting from telling you this information (Google is a $200 billion company), you would be wise to at least investigate Google as a possible investment. What if your broker called you up and was imploring you to move your assets out of bonds and cash and into the equities market? What if he said that he anticipated a "50% upwards move in the next 12-18 months"? Seeing as how he would generate commissions from you moving your portfolio from bonds/cash to stocks, you would definitely be wise to be cautious. What if your friend called you up one evening to "let you in on a secret"? What if he proceeded to implore you to buy "many" shares of a stock that was currently trading at just 5 cents per share? Again - tread cautiously, as your buying interest (if you were to have any) would likely result in the shares trading higher. When it comes to money, people tend to do foolish things. What's the point of this blurb? 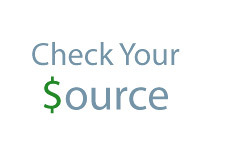 Always consider your sources. 1. Is this person trustworthy? 2. Do I have a track record with this person? 3. Could this possibly possibly have an ulterior motive for giving me this "information"? The National Association of Realtors wants you to buy real estate because then home values might start rising again. Considering that the National Association of Realtors is a trade organization for realtors, they would obviously have an ulterior motive for making their "predictions". The friend who is suggesting that you buy Google? It sounds as though he legitimately wants to pass along some helpful information, as he couldn't possibly benefit from having you buy shares of Google. Given his successful track record, this is probably some information that you would want to consider acting on. Your broker? He wants you to start buying stocks so that he can generate some commissions. Your friend? He probably wants you to buy the penny stock so that your buying will move the stock higher. Or, even worse, he is a promoter for the company. In the end, in order to be successful when it comes to investing YOUR hard-earned money, you must do some of your own research. Sure, the viewpoints of others are important, but you should never follow someone's advice blindly, whether it is from your best friend, your broker or the author of a stock newsletter that you subscribe to. You need to be able to organize and sort all of this information in your head, complement it with your own due diligence and then develop your own informed opinion. If there is anything that the last 2-3 years have taught us is that "experts" can be wrong too - very, very wrong. Nobody will guard your money and investments with more care than you will.